Considering his near perfect junior season on the mound, there are even a string of superlatives that don’t do Dawson Netz justice. Even words like “awesome” and “dominant” and “unparalleled” don’t seem strong enough for a guy that refused for anything less than perfection. And while we say ‘near perfect,’ we mean it. Netz went 12-0 with a 0.26 ERA. That includes eight complete games, seven shutouts and two no-hitters. 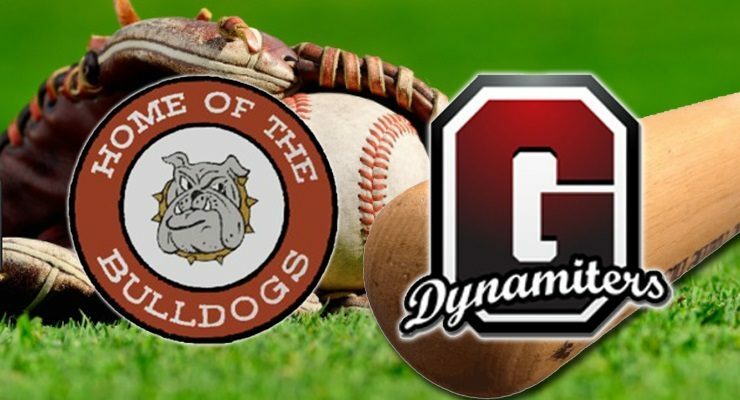 Netz set a new CIF record of 59 consecutive innings without allowing a run that wasn’t snapped until the fifth inning of the CIF-D3 opener against Palos Verdes. 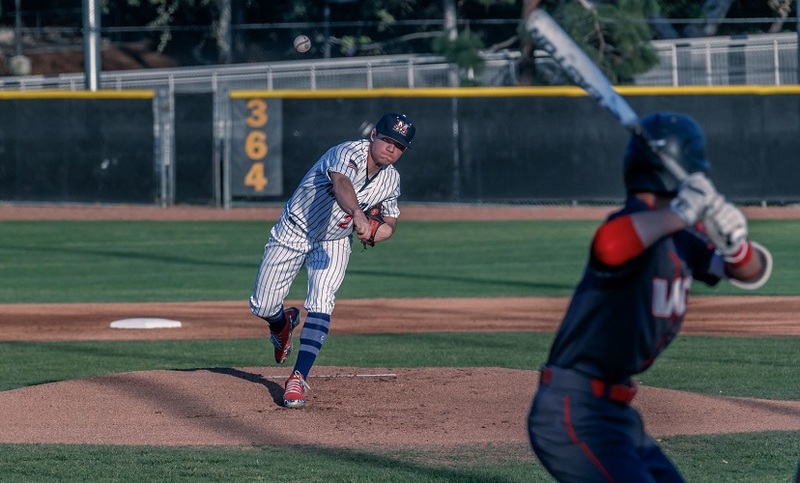 He allowed just three earned runs in 80 innings pitched in all of 2018, and found himself on the mound in one fashion or the other in all five of Maranatha’s five postseason games (and wins). 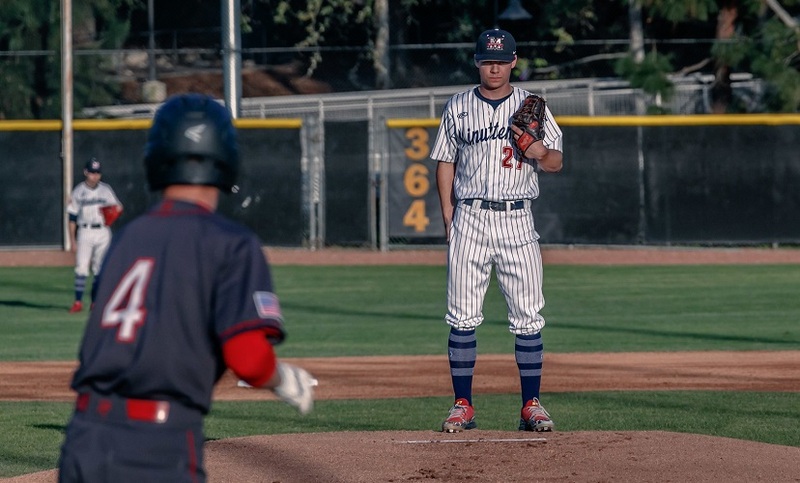 Netz shut out Redlands on the road in the CIF-SS Division 3 semifinals, and because of the 10-inning per week rule in place, the MHS junior was eligible for just three innings last Saturday in the D3 title game against La Salle. 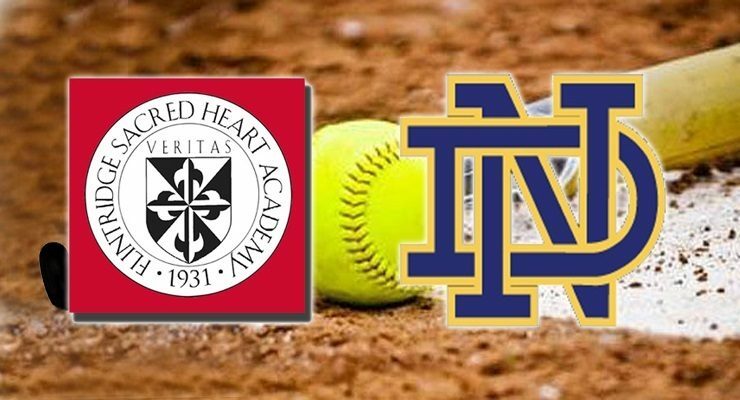 Fortunately and quite timely for Maranatha, the Minutemen scored four runs in the bottom of the fourth inning to take their first lead of the championship game. 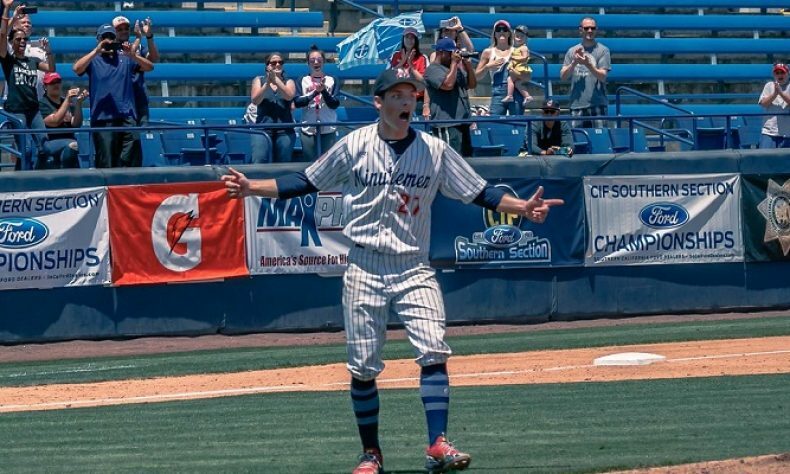 And once that happened, and knowing they were just three innings from a CIF championship, No. 27 walked calmly and with a purpose out of the third base dugout to the mound. While in the process of putting the game to bed, Netz got five of his nine outs via strikeout, including the final batter of the game to earn his school their first championship in eight years. For a competitor that always seems to be wearing his poker face throughout his battles, the picture of this quality young man realizing MHS had just accomplished their enormous expectations was pretty moving, and it was something we hadn’t really seen all season. 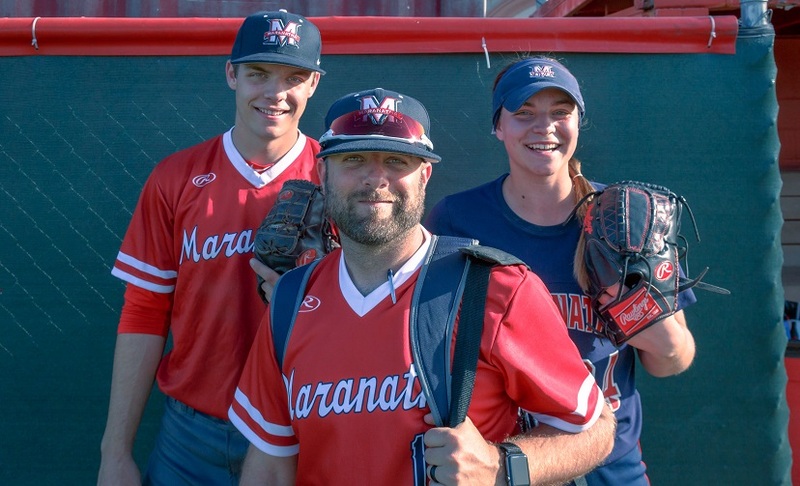 Maranatha (27-4, 12-0) earned back the Olympic League title by going 12-0 and that 4-2 victory over La Salle at Cal State Fullerton last Saturday was their 20th consecutive win in 2018. Netz’ record and ERA are just two of the incredible stats he put up this year, but there are more. He walked just 14 batters and struck out an area-best 117, for a better than 8-to-1 strikeout-to-walk ratio. For his better than great junior season on the mound, Dawson Netz has been named the 2018 Pasadena Sports Now Most Valuable Pitcher. His career (varsity) record through his junior year is now 20-4 and he still has one more season to pad those already gaudy numbers. What separates Netz from everyone else is literally his ability and confidence to throw any pitch in any count and with the control to spot his pitches throughout the strike zone. He’s so much smarter in his approach and mind set than almost any batter he faces, and his excellence in the classroom with a GPA north of 4.0 makes his life story even more remarkable. Early in the season, in one of the many conversations we had with Netz, he boldly claimed that anything short of a CIF championship would be considered a failed season. So, having the chance to be on the mound to close out the title, and doing so via strikeout had to make the reality of exceeding even the highest of expectations that much sweeter for Netz and his teammates. 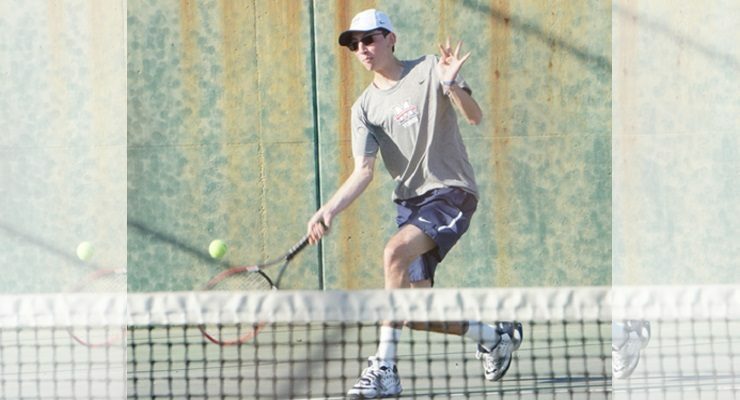 For those who have followed his career, and especially this season, you know Netz is committed to the University of Arizona for 2020. But with his stock soaring and thinking ahead to the possibility of yet one more season comparable to this one, most expect to see Netz drafted in the first round, which would give him the option to forego collegiate ball and begin his professional career immediately. When asked about the dilemma that could lay ahead next June, Netz didn’t want to look past his next game for his travel ball team, let alone even the first pitch of his senior season in late February of 2019, and it’s that focus and approach that add to his already elite status. Aside from the wins, the scoreless innings streak and the strikeout-to-walk ratio, another reason his stock continues to climb is that he started the season with a fastball clocked around 89 mph and finished the year having hit 94 on the gun. 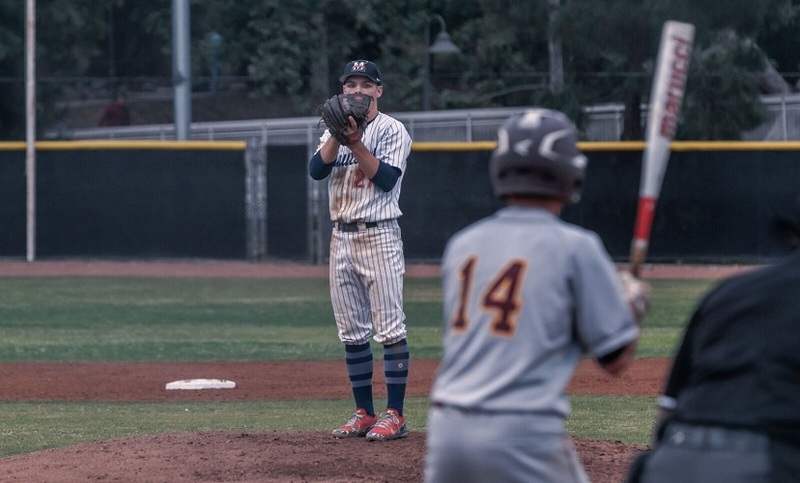 Roger Penticoff, who has led St. Anthony and Long Beach Jordan, and currently runs the Cerritos Valley Christian program said Netz is as good or better than any Division 1 pitcher he’s ever seen. 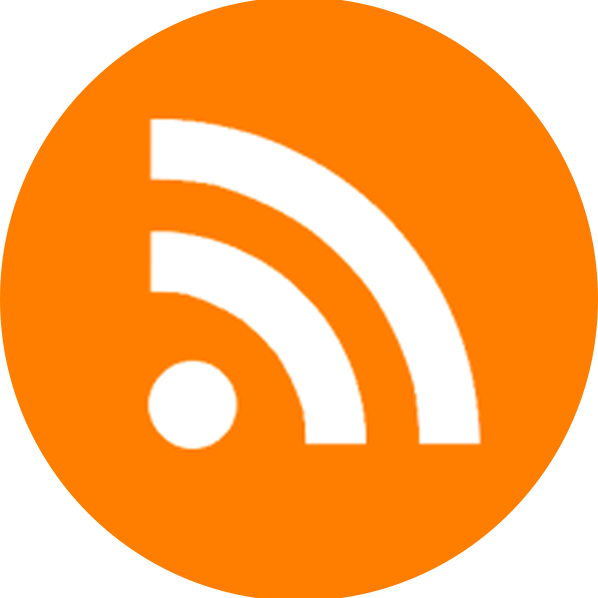 This reporter, in a 19-year and counting career has covered current professional pitchers, including Jacob Faria of the Rays, Chase DeJong of Seattle, Shane Watson formerly of the Phillies and Justin Garza, who’s in the Indians system, and no pitcher we’ve seen has consistently made batters look worse than Netz did in 2018. His ascent, he has acknowledged, began in the 2017 playoffs when he came on after two rough starts by Charles Acker, the MHS hard-throwing lefty, and Netz used the opportunity to literally take over postseason games. That confidence and effectiveness continued on to 2018 in a season for the ages. But consider one final thing when taking in what we all just witnessed, and in measuring Netz is his totality as a baseball player and competitor. In spite of limited at-bats, he batted .365 with 23 hits, he scored 17 runs, drove in 14 and doubled six times. He’s known for his pitching, but he’s tallied 72 hits and his coach, Matt Shupper, has already said to look for Netz in 2019 to play every day and contribute with his bat. Netz also made it clear that fellow pitchers Will Downing (4-0, 0.20 ERA), Max Blessinger (4-0, 2.57), Casey Popham (2-1, 2.62) and Charles Acker (3-1, 3.00) were incredibly vital throughout, but especially in the latter half of the season where they went eight consecutive games without allowing a run, not to mention their contributions in the postseason. For a guy that has never had an ERA in three prep seasons over 1.00, and with an expectation level somewhere in the stratosphere, 2019 should be a very entertaining season for all of us, including his teammates, coaches, family and even Netz himself. 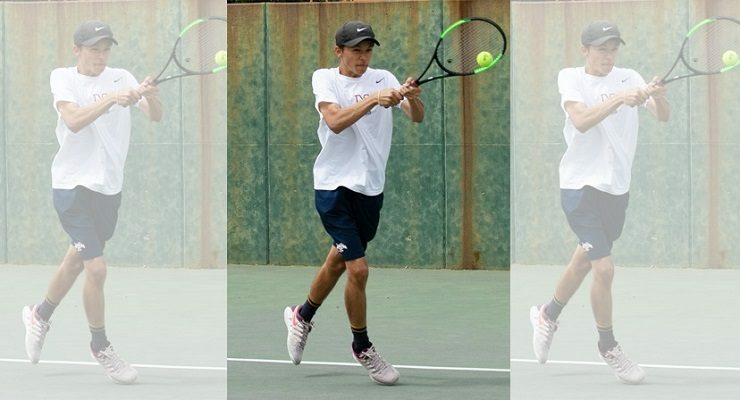 “I am obviously happy with the season I had and more importantly, the year we had in putting everything together and winning both the Olympic League and CIF (Division 3) championship. None of this could have been done without every teammate and coach that contributed in so many ways to our success.